Many across the world continue to digest what took place in Aleppo and the slaughter that was beamed across the world. Recep Tayyip Erdoğan as well the Saudi and Qatari regimes sat on the benches as the slaughter took place in Aleppo, despite having supported and armed many of the groups previously. In the most critical hour for the rebels and the people of Syria, they abandoned them and left them to be slaughtered. Bilal Abdul-Kareem from On the Ground News (OGN) reporting from East Aleppo highlighted: “I will like to say to the Muslim Ummah that is out there, guys, you dropped the ball on this, you know Erdogan, nice recitation of the Qur’an, but you really blew it this time, you really really had the opportunity to be the hero, fly in here with the cape and help out these poor people with your troops just 25k away from Aleppo, but you blew it. And a whole lot of other folks: the Qataris, the Saudis, you all blew it, you all had a golden opportunity.” Many Muslims across the world remain stunned at the inaction of the Turkish regime at what took place in Aleppo. Some have taken to social media to defend the Erdogan regime’s inaction, arguing the presence of Russia as an obstacle, the lack of capability and the regional repercussions for Turkey as reasons for inaction watching the slaughter from the sidelines. 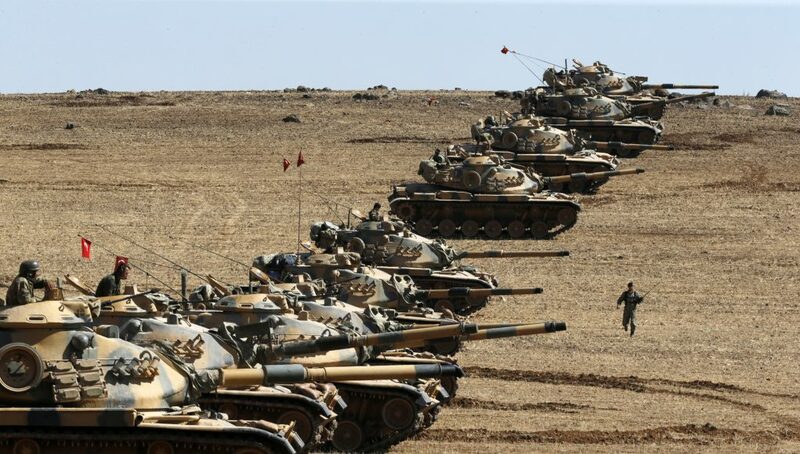 Scrutinising these reasons show Erdogan’s calculations are rooted solely in political considerations – which does not include defending the Muslims of Syria, rather than military or tactical considerations. As the call for Turkey to intervene grows, in this Khilafah.com Special Report we assess what a Turkish intervention in Syria would look like and the challenges it would face. We all want to Turkish intervene to Aleppo. But it is not as easy as we saying. Turkey had a Military Coup attempt on 15 th July 2016 which was started a terrorist organization called FETO that supported by Western countries and many of our brothers were killed by betrayer soldiers from Turkish Army. Alhamdulillah it was not succeed because of the our brothers ans sisters who are civilians that tried to stop tanks and armed soldiers without any gun just wirh their IMAN. Even today, Turkey trying to deal with that organisation: FETO. Turkey has operations in Al Bab, our brothers are become Suheda everyday in Syria. Turkey has operations against PKK which is another terrorist organization supported by Western Countries. They make bomb attacks, attack on Turkish Soldiers, Police and civilians almost every single day. A couple of days ago russian consulate has shot to death in Ankara to take us into a war against Russia. We are really in big trouble in our country also. But we are trying to do our best although the difficulties Biiznillah. Turkey is trying to protect and save all of his muslim brothers from East Turkistan to Myanmar, from Checenya to Bosnia, from Musoul to Aleppo. And almost every week both Turkish People to Turkish government send money, food supplies, clothes etc. to our brothers in all over the world. Today almost 5 million Syrian brothers and sisters ( i am not counting brothers from Iraq, Turkistan, Bosnia, afganistan,libya..) are living in here Turkey with us just like Ensaar and Muhacirin. And I am asking you my brothers and sisters: What did you do for our Ummah except duah? Is it correct to judging us; Turkish people, without judging yourselves? InsAllah we get enough power to help to our brothers in the world and save them from kuffarin and munafiqin. InsAllah we can see the Chaliphate’s Sanjak rise from Istanbul to spread Ilayi Kelimetullah to protect our brothers and to live the real Islam in our countries. Jzk for you comment, the issue at hand it the Turkish regime seems to intervene and use its army when it wants to, but when it doesn’t want to it raises excuses that it cant. So it can enter Syria because of the Kurds, Ottoman tomb and other areas when its in Turkish apparent interests, bit it can hear the bombings in Aleppo from the Turkish border and then says it cannot do anything.